This week's tablehopper: operation sunshine. 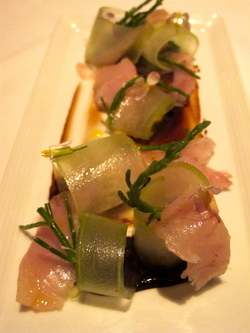 Aziza’s albacore with sea beans, cucumber, and black garlic. I am so ready to punch the clock. Lake Tahoe, your 80-degree weather and sun and squirrels and chilly nights (and even colder lake) and mountain air are calllllling meeeeee. Although boy, do I have a lot of work to get done before I hit the road. Leaving town: it’s like a military campaign—and Alexander the Great never had to deal with this many emails. Yo folks, I have some excellent news: we have even more kickass vendors added to the tablehopper Happy Ending after-hours party next Friday night at E&O: Turtle Tower will be there debuting their bahn mi, Basil Canteen will be serving Thai dumplings called sakhoo saimu (tapioca dumplings of pork and peanuts wrapped in lettuce), and the lovely duo from DeLise Dessert Café will be scooping some of their ice creams and sorbets (hello, coconut pandan). Oh yeah, baby. Get your tickets and more info here. Hope to see you next Friday—let’s par-tay!